I’m in Florence, Italy, reunited with my daughter who has been studying at an art school here this semester. She’s wrapped up her work, turned in her key, and she and I are having a great time, toodling around Florence, seeing her world, poking around her school, the Christmas market and all that. For the first time in years, Florence has snow and it’s amusing to watch the unfamiliar locals wiping out on their bicycles and trying to shovel the snow in front of their shops using brooms and buckets. I could see the orange roofs of Florence from the airplane window, but the captain announced that the Florence airport was nonetheless shut down due to snow and we were being redirected to land at Federico Fellini Airport in Rimini, italy. It was the first sign that things were about to get weird. In Italian, German and possibly Swedish, the Lufthansa people announced their plan to get us to Florence, and passengers began muttering and scattering in various directions to rent cars, make phone calls or otherwise leave the airport. It was quite awhile before the translation drifted to the rest of us that there would eventually be a bus but the road might be closed anyway. A band of eight of us decided to hang together, come what may. I have no working cell phone outside the US, so I was lucky to find a pay phone to make a five minute call to my wife, who relayed the message to our daughter that I was fine but no one knew how or when I would get to Florence. The first two hours on the bus were promising, barreling toward Bologna, but when we turned onto the road to “Firenze” traffic was stopped and we found ourselves sitting stock still and unable to extricate ourselves from the doomed snarl. The bus driver threw up his arms and shouted “CATASTROPHIA!” and for two more hours we crept forward in a glacier of vehicles. Ultimately a woman with a foot in both Italian and American worlds stepped forward as our group leader and wrestled from the driver that the road ahead was closed and the only plausible scenario was to return us to the Bologna train station, at which point we were on our own. It was 10PM and I’d been traveling for 26 hours. Somehow Ruth got us through the horrendous mob at the Bologna train station to the ticket window and then to the bitter cold platform where we learned that not only was the train delayed, but it could not get us to Florence either. Its destination was now a small village outside of Florence. I opened my suitcase and began putting on layers of clothes. From the windows we saw workers with torches — torches! — trying to melt the snow on parallel tracks. Our group had been assigned seats in different train cars, so by now I was truly on my own. One depends on the kindness of strangers in these situations, and new friends in my compartment, all with problems of their own, took the time to find maps on their iPhones for me and translate the announcements that trickled in. In the end a shuttle train was found that could take me into the central station in Florence. Taxis had all shut down. An abandoned bus sat in the middle of the street. A huge Christmas tree stood silently sparkling before the Duomo. I was able to walk the mile to my hotel in the middle of the silent night, dragging my luggage through the snow. From my room I called my daughter and she came running from her apartment. We sat up eating pears and cookies. When I woke up the next sunny morning I was in exactly the same position as when I’d fallen asleep. 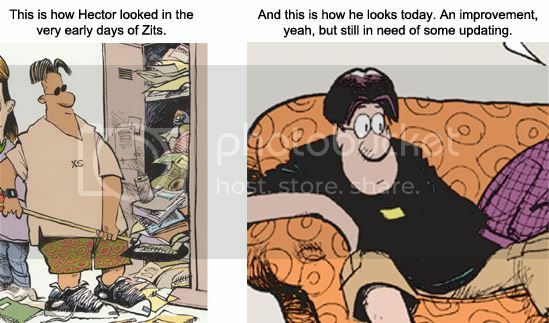 It’s time for a little look behind the scenes at Zits. Comic strip characters tend to morph and change slowly over the years. Often it’s not a conscious effort, but something that just happens with time. The other day I was writing, just riffing on nothing in particular when I started thinking about Hector’s appearance. He’s arguably the least teenager-y character in the strip (no offense, Pierce), and possibly the strangest looking (sorry again, dude). He was originally conceived as the quiet, reasonable best friend that would contrast with Jeremy’s more exuberant personality, and that worked okay. But over the years, as Jeremy settled into his own skin – or ink – Hector became less and less visible. So the idea of a Hector makeover started to emerge. An improvement, yeah, but still in need of some updating. 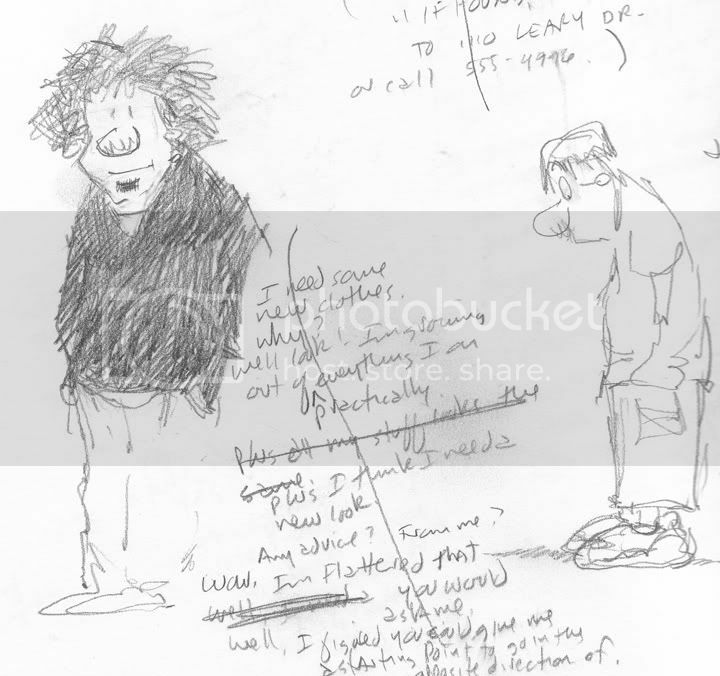 So here’s a section of the page from my sketchbook as this idea was taking form (all that scribbly handwriting surrounding random drawings is how I write the strip). It was interesting enough to me that I sent the sketch to Jim for his opinion, and it turns out that he’s never really been happy with Hector’s appearance and was 100% behind the idea of updating his wardrobe and overall look. The really cool thing about all this is that this change in Hector’s appearance is going to tweak his personality a bit, too, giving a fresh set of conflicts between he and Jeremy. 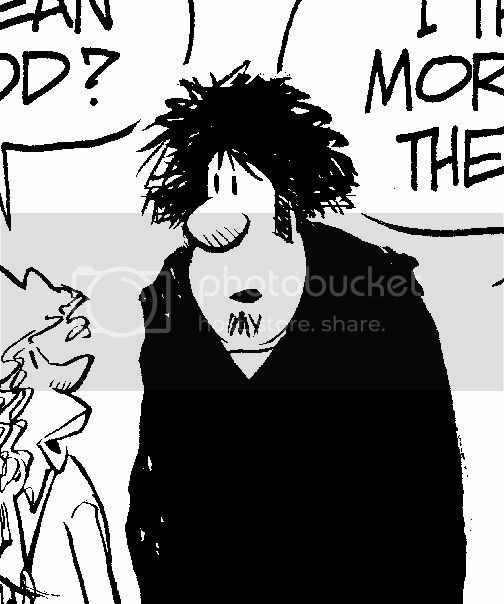 So keep your eye out for the new Hector in the January 13th strip (yes, we do these that far ahead of publication). Here’s a sneak peek. My buddy Jeff Koterba emailed me the minute this strip hit the comics page of the Omaha World Herald. Jeff's the estimable editorial cartoonist at the OWH and way more. If you haven't read his memoir Inklings, it's fascinating. And beyond that, Jeff heads up the swing band Prairie Cats which does all the music at the annual National Cartoonist Society's Reuben Awards festivities. He may well dance in the Nutcracker, too, for all I know — a true Renaissance Man. I think this mini-series about Jeremy not being able to get through Wuthering Heights was initiated by me in my coffee shop sketchbook and passed along for Jerry's magic touch. It called for Jeremy to end up somewhere far from home, and since we intentionally never identify Jeremy's home, that place seemed to be Omaha, a place that seems far from almost everyone's home. I Google Image Searched "Omaha skyline", gathered several reference photos, spread them across my screen, and then totally fudged it. Koterba claims he could tell it was Omaha even before he read the punchline. "The building on the left is Woodmen Tower which I wrote about in Inklings." Gracious man. Today’s comic strip and all ZITS original art is available at The Framery on Hyde Park Square. Leave a message for Jerry and Jim.